It's rare to find a band these days that comes across as completely uncomplicated, straightforward and without pretense, but Chicago's Alive Day do just that. There's a pureness and positivity running through the band's debut record,"Blindsided by Hope," that sets them apart from the sea of bands who are just as concerned with crafting an image as they are with crafting a good song. Lead singer, songwriter and guitarist Dan Arrecis and the rest of the band deliver a style of music that's somewhere between classic power pop and modern radio rock, featuring pure vocals, loose production and melodies you'll find yourself humming hours after listening. Just look to opening track "Only a Rumor" and its instantly memorable chorus, or the catchy guitar riff of "Drifting," for the proof that the band has no trouble crafting strong hooks. These tracks are perfect examples of the wide-eyed optimism present throughout the entire album. There's nothing complicated or heavy-handed about them, and that's their greatest charm. "Blindsided by Hope" sounds like a labor of love from an incredibly sincere band, and it's hard not to feed off the energy these guys offer up on the CD. 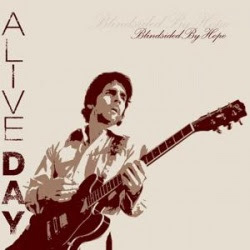 Alive Day are definitely worth a listen if you appreciate a good pop hook and a down to earth approach to rock and roll. Check out the band live on January 29 at Lilly's and February 17 at Empty Bottle.